Russian Heavy Draft horses originated in Russia and the Ukraine. They are considered to be a younger style of horses, one that began in the middle of the eighteen hundreds. 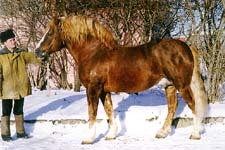 The state studs were noted as Khrenov and Derkul and were mated with local mares, as well as the Ardennes breeds. The Russian Heavy Draft was once even used in the Paris Exhibition in 1900. In very little time at all, the breed was introduced to newer blood lines, such as the Brabant, Percheron, and the famous Orlov Trotter. The breed went on to be virtually extinct once the first World War was over, and then again following the Russian Civil War. Used for agricultural and lighter draft work, they continued to expand the breed. The style went on to be used to create a fermented drink that was called ‘kumys’. Experts say it was a great drink tonic and used by many people during the nineteenth century. Russian Heavy Draft horses are used for light draft work, harness work, and agriculture needs as well. They can be found in the Russian Federation in areas such as Kiev, Khrenov, Derkul, and other parts around the Black Sea. They can be seen still to this day pulling farm carts and other goods. Russian Heavy Draft horses stand at around fourteen hands when fully grown. They have a refined head, a medium neck, deep chest, low withers, a long back, shorter legs, and a sloping croup. Their backs are long and their forelegs are set very far apart.